Mick Comley has today raced his way to a solid feature win at Ellenbrook Speedway in the latest round of the Forma- tel Late Model Winter Series. Comley started from pole and immediately hit the lead as the feature race went green as David Nylander shot into second place. Clint Marriott attempted to show the nose to Nylander, but he was having none of it, racing away and attempting to chase down Comley, who had already opened up over a second’s gap by the second lap. 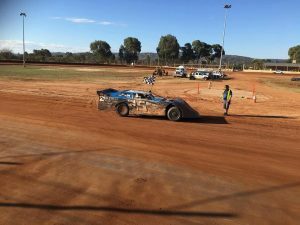 Nathan Callaghan was all over the back of Marriott as he looked for a way through for third place, while Rob Wells went for an excursion on the infield that put him a lap down and Lance Ferguson retired. Callaghan then finally made the move on Marriott, grabbing third with just two laps remaining, but up front it was all Comley, crossing the line ahead of Nylander. Heat One, 8 laps: 1. Clint Marriott, 2. David Nylander, 3. Mick Comley, 4. Rob Wells, 5. Lance Ferguson, 6. Peter Seaton, 7. Daniel Green. DNF: Nathan Callaghan (5). DNS: Simon McNab. Total Time: No Time. Winning Margin: 1.256. Fastest Lap: 20.099 Mick Comley. Heat Two, 8 laps: 1. Mick Comley, 2. David Nylander, 3. Clint Marriott, 4. Peter Seaton, 5. Nathan Callaghan, 6. Simon McNab, 7. Lance Ferguson, 8. Rob Wells, 9. Daniel Green. Total Time: No Time. Winning Margin: 2.075. Fastest Lap: 19.559 Mick Comley. Heat Three, 8 laps: 1. Mick Comley, 2. Clint Marriott, 3. David Nylander, 4. Nathan Callaghan, 5. Lance Ferguson, 6. Rob Wells. DNF: Simon McNab (6). DNS: Daniel Green, Peter Seaton. Total Time: 2.46.070. Winning Margin: 1.436. Fastest Lap: 19.877 Mick Comley. Feature, 15 laps: 1. Mick Comley, 2. David Nylander, 3. Nathan Callaghan, 4. Clint Marriott, 5. Rob Wells (14). DNF: Lance Ferguson (7). DNS: Daniel Green, Simon McNab, Peter Seaton. Total Time: 4.58.991. Winning Margin: 2.779. Fastest Lap: 19.409 Mick Comley.